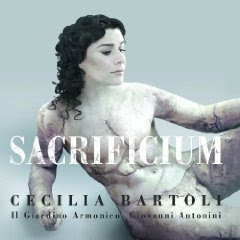 This is the cover of Cecilia Bartoli's new album Sacrificium. She's supposed to be a marble statue of a castrato, I guess. I think it's a bit creepy. The tracks are all from Italian composers and were composed mostly between 1723 and 1746, the greatest period for virtuoso castrati. I can't believe anybody thought this was a good idea for a cover. At least, not once they'd seen it. I vaguely recall you saying Cecilia was insane. And so she is, but in the good way. Whoever came up with this is, I suspect, insane in a bad way. Nice trailer. I love to hear her speak English. Maybe I just love her. There are more pictures like the cover one. I'm still dubious. It's a good cover, I think. It's an album of songs that were originally written for castrati: the photoshopping of her head onto what is obviously a classical Greek statue shows the juxtaposition between the castrati's male body and seemingly female voice. It also alludes to the ancient Greek fascination with androgyny.